In this inspiring audio, Deepak Chopra challenges our assumptions about the nature of reality, and answers age-old questions about the meaning of our existence. 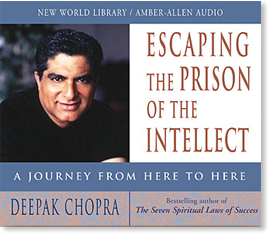 With remarkable insight, Chopra reveals how the intellect creates prisoners of us by mistaking images of reality for reality itself. As a result, we lose touch with our true nature and become trapped in a suffocating web of space, time, and causation. But we can escape the prison of the intellect, come to know our true nature, and experience unbounded freedom. In his calm and assuring voice, Chopra explains how we mistakenly depend on our senses to define our reality, but there’s a great deal more to reality than what our senses reveal. Freedom awaits those who are willing to challenge their assumptions and join Chopra in this fascinating and uplifting journey toward a more fulfilling life.